My 300th root beer review! For such a special moment I had to pick a special brew and this one is special indeed. Sprecher Honey Root Beer is a limited edition celebratory soda made in honor of Sprecher Brewing Company’s 30th year. They did a limited production run of only 3000 cases. So it was the natural pick for my 300th, to complete the trifecta of 3 times increasingly larger powers of 10. Also this brau is sweetened with only raw honey. Which is a bold move as too much honey can be dangerous. Yet, I love honey and I love Sprecher, so this should be good. I love the honey themed label, with the demonic raven thingy now clutching a hive. It also says “Craft Soda”. While I prefer to go with the label of gourmet root beer, craft soda/root beer is an appropriate label as well. I’ll write more about those distinctions another day, because the Sprecher is waiting. The Body is light on standard root beer flavors and very heavy on the honey, being the only sweetener. It’s sort of a fruity raw honey which overpowers the rest of the flavors. The Bite is a light honey bite on the back of your throat. If you’ve ever eaten a spoonful of raw honey, you know what I mean. The carbonation is severely lacking, sadly, which makes the brew even heavier. The Head is pitiful, just pitiful, which is very disappointing. The Aftertaste is more raw honey, some fruity raw honey. I do love me some honey, but this was too much honey and not enough of the other wonderful flavors that Sprecher has. The low carbonation really killed it for me as well, not only was there no Head, but it was too thick and syrupy without all of those bubbles in it. What a shame. At least it will not be missed after those 3000 cases are gone. See how rates against other root beers. The Body is sweet and smooth with a nice honey flavor to it. One of the best root beer bodies that I have ever tasted. The Bite is there, but not too much, more on the smooth side, like I like it. The Head is good and frothy, but, unfortunately was a little too short to rank higher. The Aftertaste is also very nice with the honey. Wow! This stuff is great. The only thing that could be improved would to have more vanilla flavor to it and a taller Head. All in all, this is a top notch brew. The fact that they sell this in pints means you always get an extra four ounces of goodness and trust me, you’ll always be wanting it. Since I originally reviewed it the label has changed to add that it was voted #1 by the New York Times. 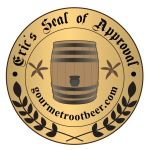 Well, I’m awarding my Seal of Approval, which is far more prestigious than anything in the Times. See how it rates against other root beers.